Eyes are well-developed, but are still located on the side of the embryonic head. As head development continues, they will migrate forward. 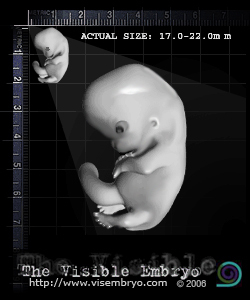 External ears are set low on the embryo's head, but will move up as the head enlarges. Over the next few days, tongue development finishes. Intestines begin migration within the umbilical cord towards the embryo. Liver causes a ventral prominence of the abdomen. Fingers lengthen while distinct grooves (digital rays) form between the fingers, which also lengthen as the hands approach each other across the abdomen. Feet approach each other, but are still fan-shaped and the toe digits are still webbed.